ISLAMABAD, Sep 8 (APP): President Mamnoon Hussain Thursday expressed his deep grief and sorrow over the demise of Uzbek President Islam Abduganiyevich Karimov. Tulkinovich Yuldashev, the president expressed his condolences to the bereaved family and the people of Uzbekistan, a President House statement said. during the tenure of late Islam Karimov. Journey of development by Uzbek people under his leadership was a golden chapter of the history, the president added. 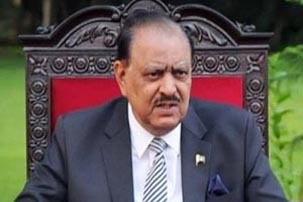 President Mamnoon said the bilateral ties between Pakistan and Uzbekistan got strength during the Karimov’s presidentship. He prayed for courage and patience to the Uzbek people to bear the loss with fortitude.